Welcome. This website is geared towards promoting sound doctrines and practices for the Christian life, based on sound interpretations of the Bible. Please explore the links above to discover more about growing to maturity in your understanding of God and His Word. In Conversations Worth Having, J. L. Moore discusses how Christians can lovingly engage Jehovah’s Witnesses based on a time-tested method of biblical evangelism. While providing a biblical analysis of the history, beliefs, and practices of the Watchtower Society, he also includes examples from his own conversations with the same Witness for over a year. 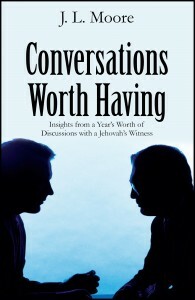 After reading this book, you will be better prepared to share true biblical teaching with the Witnesses in your life through participating in conversations worth having. After all, virtually everyone is acquainted with Jehovah’s Witnesses, but not many Christians are equipped to have meaningful Bible discussions with them. This book is designed to both equip and challenge followers of Jesus Christ to lovingly dialogue with the Witnesses in their life. Could the Civil War, September 11th, and the Newtown, Connecticut school massacre have been prevented? Yes, but not in the way you might think. Gospel Urgency highlights the necessity of every Christian to share the gospel with as many people within their sphere of influence as possible. It then describes how the power of evangelism can effect permanent transformation, both individually and within the broader society. 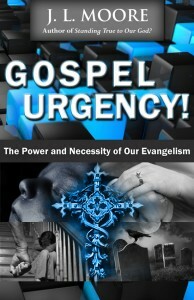 This book is designed to both encourage and challenge you to take evangelism more seriously than you ever have before. After all, when Jesus Christ left His Church with the Great Commission (Matt. 28:18-20), He was not playing! We must share the gospel regularly because Jesus commands it and the state of our world demands it. That is what this book is all about. What is the One Thing that Challenges Christians the Most? If you were to ask most believers what is the toughest part of being a Christian, they would most likely respond in one of the following ways: resisting temptation, loving one’s enemies, or enduring pain and suffering. 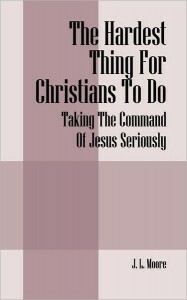 Yet, according to J. L. Moore, the most challenging thing for Christians to do is to obey the most practical command Jesus gave to His disciples. The Hardest Thing For Christians To Do describes how believers in Jesus Christ have in subtle ways neglected to practice the simple yet profound mandate to express heartfelt love and concern for one another. Though the consequences are apparent in various ways, J. L. Moore offers a message of conviction and hope to Christians who are ready to take the command of Jesus Christ more seriously. The Black Church in America is perhaps the most victorious institution in the African American community. Yet, when it is compared with sacred scripture, we find that the Black Church is falling short in very significant areas. This book not only highlights where members of the Church have strayed from the truths of scripture, but also offers a message of hope for those who are willing to embrace the need for biblical reformation. What should the Black Church look like in the twenty-first century according to biblical teaching? 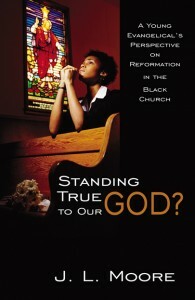 This book explores various topics while providing stimulating answers to that crucial question. Are you prepared to reach out to those who are on the wrong road? Do you know how to respond to atheists who may ask you perplexing questions? Can you have a winsome dialogue with a Jehovah’s Witness? If your honest answer to any of these questions is no, this book is for you. 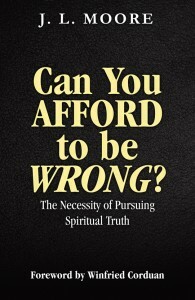 Can You Afford to be Wrong takes you on a journey through some of the major world religions and belief systems across the world (including atheism), and unpacks the essence of their claims to spiritual veracity. By the end of the journey, you will have a solid basis for understanding how to intelligently share the gospel of Christ with a variety of people. If you really want to be equipped to ‘become all things to all people’ (1 Corin. 9:22) for the sake of the gospel, learn how to wisely evangelize those who are on the broad road which leads to destruction. -From the Foreword by Winfried Corduan, Ph.D.
• were discouraged in your relationship with God? • were distracted by a crying infant during a church service? • shared the gospel with an unbeliever? • heard someone say they ‘rededicated’ their life to Christ? • heard an intense conversation about sports among Christian men? • were taught how to present and defend the gospel? If your experience is similar to most Christians, you have probably never spent much time reflecting on the issues above as they pertain to the seriousness of the Christian life. 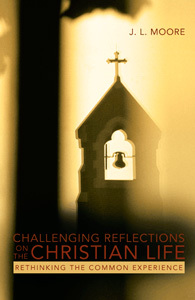 Challenging Reflections on the Christian Life covers topics that include raising children ‘in the church,’ evangelism, apologetics, men and sports, the concept of ‘rededication,’ the pastor’s primary responsibility, infants in the sanctuary, knowing God, and much more. This book is designed to encourage you to give deep contemplation to the all-too-common experiences encountered in the Christian life and lead you to an awakened sense of reverence for God and passion for the truth. Whether you are a new Christian or a seasoned pastor, this book will cause you to rethink much of what you see in your life and in your church.